Our luxurious home occupies a Triple plot (South West facing) overlooking a natural lake in a quiet conservation area. The house has been furnished to a very high standard. Both master suites have doors opening out to the extended pool deck, which is equipped with 6 sun loungers, 8 chairs and large table. The pool deck is ideally positioned to watch the sunset over the lake. The pool and spa are electrically heated. The house has been equipped to provide visitors with every comfort and convenience. Attractions and Distances: Beaches of Englewood, Manasota Key and Boca are just a 10-15 minute drive away. A choice of large supermarkets and excellent restaurants within 5-10 minutes drive. Golf, tennis, go-karting, deep sea fishing, jet ski hire, water sports, boat tours, bowling, cinemas, Port Charlotte shopping mall with its excellent department stores are all within a 15-20 minute drive. Myakka Nature Reserve and river tours 1 hour. Busch Gardens 1.5 hours, Orlando 2.5 hours, factory outlets at Fort Myers and Sarasota 1 hour. We are a family from Worcestershire who have been coming over to Florida for 20 years. We all love it here and come over three times a year to relax and enjoy the beautiful beaches, weather, restaurants, not to mention the shopping! We also love riding our bikes, playing tennis and golf. There is so much to do here. We were looking for some time to find a holiday home on the Gulf Coast and visited everywhere from Sarasota to Naples. However although the houses were all wonderful, the plots of land were always very small and penned in with little or no views at all. Then we found Rotonda with its many lakes, canals golf courses and nature reserves. The plots were large and the views spectacular. The area is well maintained and very safe. It had everything we wanted. It also had the added bonus of being so close to Boca Grande, with its fabulous beaches and restaurants. A 20 minute drive and you feel like you have been transported to the Caribbean. One of the best qualities of the villa has to be the wonderful view. We built the villa on a large double lot which has one of the best views on Rotonda overlooking a lake and over to the first green of the Pine Valley golf course.We also own the vacant lot to the side of our double lot for added privacy. It has an extended caged pool area ideal for sunbathing and sitting with a glass of wine in the evening watching the amazing Florida sunsets. The villa is loved and beautifully maintained and furnished to a very high standard. We chose the Usseppa design as it has two large master suites on opposite sides of the house which both open straight out to the pool. As we visit so often we always make sure everything is regularly updated and kept in tip top condition. The villa has lots of facilities such as Smart TVs with Netflix and YouTube, bikes, wifi, tennis rackets etc. Many of our guests love it as much as we do and come back year after year. The house is equipped with 4 bikes, ,X-BOX with selection of games. 4 Smart Flat Screen TVs all with cable and Netflix , lounge, master 2, den and the twin room, games, DVDs, pool toys, Bose sound dock with Bluetooth. Pool safety screen for young children if needed, Gas Barbecue. Electric opening garage door. TVs have around 100 channels. Wireless Internet access. Free telephone calls to the USA and Canada The house is equipped with many upgrades. We spent 11 nights in the Villa. Thoroughly enjoyed the entire stay. We really appreciated the solitude (no bothersome distractions or heavy traffic). There was plenty of room for everyone, the pool and spa were remarkable and used extensively. The property manager (Dylan) was incredibly patient and responsive. We had a few questions about how the pool operated. The entire house was immaculate when we arrived and all the amenities were there as advertised. The location is a bit away from the hustle and bustle of the city which suited us just fine. We frequented several beaches, all were a short driving distance and some were bicycle accessible. Many amazing dining options in the area, but with so much available at this house we spent a great deal of time there. Amazing bike trail nearby, bikes were awesome, not cheap ones. We enjoyed the wildlife in the backyard (yes-we saw gators in the pond). With a couple of toddlers joining us, we appreciated the fence around the pool. Overall this was a fantastic place to stay and we plan on visiting again. Our family of 5 enjoyed the villa and all the amenities. The pool is wonderful which we utilized every day, sometimes morning and night. The house is very well maintained and the check-in process was smooth. The area of Rotonda West is a peaceful area away from crowds. We did a lot of driving on this trip and it is about 10 minutes to get in and out of Rotonda. We enjoyed the wild life around the house and my husband went golfing each day. He golfs about 3 times a week at home and his review of the course closest to the villa was excellent. Several times I could watch him golfing from the villa. We all took a bike ride one evening and enjoyed the bikes. The coolers and beach chairs were very nice as well. Our favorite beach was Siesta Key beach which was about a 75 minute drive but worth it. We also spent a day at Busch Gardens and Clearwater beach. We had a couple minor issues at the villa that were corrected promptly by the management company. Overall a great accommodation. So pleased to hear you all enjoyed your stay at our villa and had a great time exploring the area. There is so much to do and see in and around Rotonda. We do take care to make sure the villa is furnished, equipped and maintained to a very high standard. We do have an excellent management company looking after the house who are always on hand to deal with any issue no matter how small. We hope you may visit again one day in the future. What a wonderful property this is. We have stayed in several great villas before but this one was incredible. My parent's jaws dropped when they saw how spacious, luxuriously furnished and light the villa was! There was nothing this villa lacked and it certainly lived up to it's luxury description.There was virtually nothing we would have changed or wished for. Rotunda is a HUGE housing estate, criss crossed with bridges and waterways (containing a lot of witnessed local inhabitants!!) and you do feel like you are driving for miles but it doesn't feel crowded or busy. in fact looking at all the different properties amused us every day! The next door neighbour even came round a couple of times to share cooking and leftovers ( they were leaving..!) which was great! The furniture and furnishings are comfortable, stylish and well cared for, loads of channels on the tv - plenty of TV's too! A land line proved useful for ringing the local hospital (numbers provided luckily) but the hospital visit itself wasn't cheap - but great quick service though!! At the back of the property across the water is a golf course - the openness i really missed when we moved on to another property - watching the golfers hunt for their balls(!) is an entertainment in itself when you are eating breakfast, but the 05.30 am green cutting (in the dark) did wake me on a couple of occasions. The property itself is wonderful and I'd go back like a shot. The kitchen had everything and more that you could have wished for - the timer on the coffee machine was set so we could have fresh coffee when we woke every day - heaven! Everything was in excellent working order and it's given me loads of ideas of what I'd aspire to in the UK! (We would have liked an airier to try non tumble dry clothes but i'm being picky!!) The availability of coolers and ice packs was brilliant when we hired our boat and could keep our drinks cold.. The pool was serviced early on the friday morning which meant no swimming for an hour - but that worked out ok and it was always really clean. Do not hesitate to book this villa - The owners are really helpful and reply promptly to emails.. I can't wait to go back! Thank you so much for your glowing review. We are so pleased you enjoyed the villa so much. We do try hard to please and it seems we have succeeded. We holiday in the house three times a year and always make sure everything is kept to a very high standard for ourselves and our guests to enjoy. We chose the lot for the location and the wonderful view of the lake and the golf course. We never get tired of looking out, especially when the sun sets. We look forward to hearing from you again some time the future. 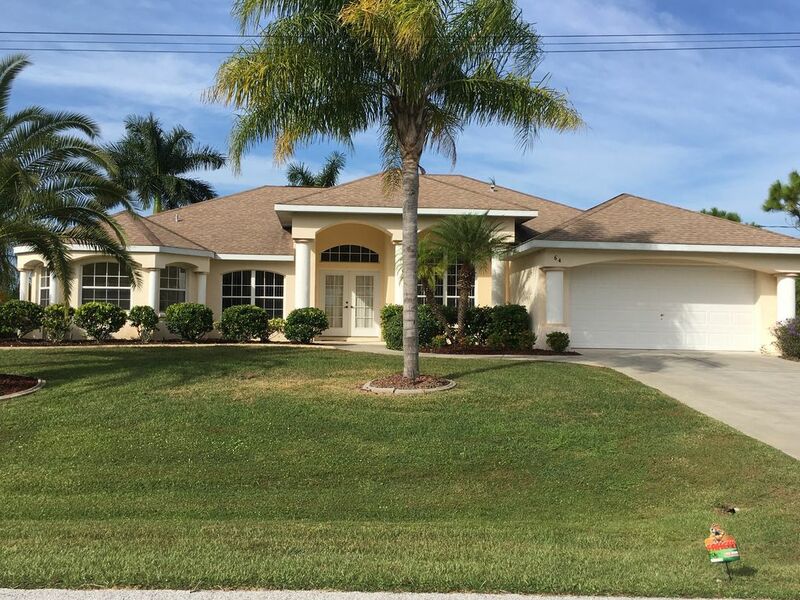 We have visited Rotonda several times and this is by far the best property we have rented. The location is quiet, peaceful and the perfect spot for relaxation whilst taking in the wildlife in the lake and the golfers on 1st hole green of Longmarsh course. There were 3 couples and ample room to accommodate us all easily. There was lots of golfing, boat trips, shopping and beach visits all within a very short distance. Both master bedrooms have lots of storage and space and are equipped with TVs. The house was immaculately clean, and well appointed with elegant furnishings. Our weather was fantastic so most of our time was spent outside on the lanai, this we found to be larger than average and spent time relaxing by the pool and in the evenings made use of the BBQ. There were lots of good quality, good condition bikes in a range of sizes for a cycle ride in the early morning. Information supplied by the owners was useful, as regular visitors we thought we knew the area particularly well, however different restaurants were listed and we found some new favourites. A visit to the shopping mall at coconut point is a must. Many thanks for your glowing review. We are so pleased you all enjoyed your stay at the villa and will look forward to hearing from you again in the future. We were pleased how well appointed the house was when we arrived. Lovely decor, excellent location with ample outside seating and sun beds for the family. All rooms (except the master bedroom) had a TV with access to all channels. Plenty of accessories around the house and storage space. The local amenities were well described in the 'local hints' folders and I we suggest these folders should be your first read as they are full of useful information. The Management Company (Denmar) were helpful too. We were sorry to leave after 31 days of relaxation and sunshine and we will be booking to go back as soon as we can. It was a pleasure!! Hi Richard Thank you for taking the time to write such a wonderful review of our villa. We are so pleased you enjoyed your stay so much and look forward to welcoming you again in the future. Located in a quiet position of Rotonda's Pine Valley overlooking a picturesque lake. Minutes from beaches, shops, numerous golf courses and restaurants. Please note all bookings are subject to an end of stay cleaning charge of £125. Prices are fully inclusive of all taxes, electric pool and spa heating, BBQ with gas, wifi, Netflix, bikes, Discounts offered to small parties, late bookings, low season bookings and long stays. Typical weekly prices are £952 or $1200 inclusive of tax. Cancellation policy 100% returned if cancelled more than 60 days prior to check in date. Please note at least one member of the booking party must be over 25.